Large kick mats - Size: 65cm x 46cm. It's large enough to cover the backs of the front seats very well. No more dirty shoe prints on the back of the seat. Suitable for most of cars and SUV. Easy to fit. Clear iPad holder - It can hold up to 10" iPad. Moreover, it has Nylon Fasten Tape at both sides of the holder. You can open any side of the Nylon Fasten Tape to plug your earphone or the charger into your iPad. Durable material - The kick mats are made of strong 600D Oxford cloth, nylon (mesh bag), PVC (clear pocket) and waterproof frosted PVC (zipped bottom pocket). Easy to clean those dirty shoe prints on them. Good storage - There are loads of pockets and space to put things in and keep them organized. You can use the mesh bags at both sides to store drinks, umbrellas and etc. And you can use the zipped bottom pocket to store books, magazines, snacks and etc. Also, you can use 2 plastic hooks to hang things like the tissue box (a free gift). These pockets keep all things organized. And then your cars become neat and tidy. Free gift - The tissue box is a free gift which comes with the kick mats. Its size is 9"x 5"x 2.5". HOW TO GET RID OF MUDDY FOOTPRINTS? HOW TO KEEP THE CARS NEAT AND TIDY? GET ONE SET OF OASSER E2 KICK MAT/CAR ORGANIZER NOW! THEN YOU DON'T NEED TO WORRY ABOUT THAT ANY MORE! ♥ Strong and Heavy-duty: Oasser E2 kick mats use strong 600D Oxford cloth and have a waterproof outer layer which is easy for you to clean those muddy footprints. ♥ iPad Holder - It can hold up to 10" iPad. It's a clear pocket which is easy for your kids to use it. And it has Nylon Fasten Tape at both sides. You can open any side of the Nylon Fasten Tape to plug your earphone or the charger into your iPad. ♥ Loads of pockets - They can help you keep all things organized. Moreover, it has 2 hooks for you to hang things like tissue box. ♥ Easy to install - Simply fasten the clips on straps around the top of the seat and around the bottom. 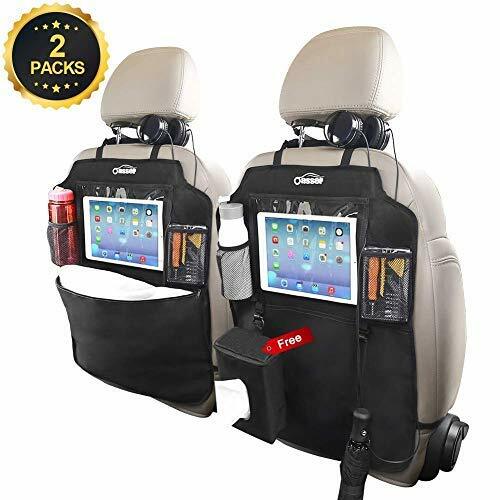 ♥ Multi-purpose - It can be used as a seat protector and a car organizer. ♥ Oasser E2 kick mats isn't suitable for the uneven back of the front seat. ♥ Oasser E2 kick mats isn't suitable for the front seat which has a handle on it. ♥ Oasser E2 kick mats isn't suitable for the front seat which is integrated with the headrest as it's difficult to fasten it. Kick Mat Size: 25.6" x 18.12"
Tissue Box Size: 9"x 5"x 2.5"